Gone Rural’s roots stretch back to the 1970s: to a small craft shop housed in a thatched hut in rural Swaziland. It was founded by the visionary Jenny Thorne, who wanted to empower women in some of the country’s most remote areas. She created an innovative business model that provided female weavers with home-based work and a sustainable income. An entire product line of tableware has been created, all completely hand made in Eswatini (Swaziland’s new official name). What once was a small start-up organisation now has a global reach, with big markets in Europe, Australia, and the United States. Managing Director Mellisa Mazingi gave us some great insight into the journey of her company in an in-depth interview that covers the history, products and weavers of Gone Rural. Gone Rural started in a mud hut as a small craft shop selling handmade clothes, accessories and anti-Apartheid literature. The person behind it, Jenny Thorne, must have been a special woman. Can you tell us more about her? I always say that Jenny was a visionary with the Gone Rural business model. Long before “social enterprise” was a trendy buzzword, she created a system that solved a problem and worked in the context of rural Eswatini (Swaziland’s official ‘new’ name). To this day, many of the women we work with – who worked with Jenny in the formative years of Gone Rural – still refer to their bread-and-butter product of placemats as “Jenny’s”, which is really testament to the legacy she left behind. She has just been honoured by the African Women’s Peace and Development Foundation on the occasion of Swaziland’s 50th year of independence for her legacy contribution to national development. Most of us have never been to Eswatini. Can you paint a picture for us of the landscape and setting where Gone Rural is based? How does it look, feel, smell? Eswatini is a beautiful country – full of mountains, many, many cattle and home to lovely people. What strikes you most is how genuinely good-hearted and welcoming everyone is. Gone Rural’s workshop is located on Malandela’s Farm, the family farm now run by Jenny’s children, and it’s a beautiful setting to come to work in every day. The smell of the grass we work with is everywhere, a lovely fresh and organic smell. And at any given time you will hear laughter or the sound of the dye team singing as they work – we have some pretty impressive baritones from the male members of our team! Tell us about life in the villages of rural Eswatini, where your baskets are made. What kind of lives do the women weavers lead? 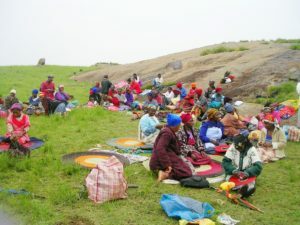 Rural Eswatini personifies the warm nature of its people. The society is made up of communities of families that support each other, particularly the women. As Gone Rural operates on a home-based work model, the women weave baskets and other home products in their homes or under the shade of trees while chatting, in between the daily household tasks of cooking, cleaning, raising children and farming. These tasks are often shared among family members. While some of these communities do not have access to electricity and other modern conveniences, their homes are warm, welcoming and familial and the women are always happy to share their life experiences. What does it mean for these women to have regular employment? The sustainability of work from Gone Rural is an essential part of the livelihoods of the women we work with. There are often few economic opportunities in the areas that the weavers hail from, especially as 50% of artisans are the primary income earners for their families. That’s what drives us to continue marketing and selling our products as widely as possible in order to increase the income of the women. Furthermore, our impact goes beyond income-earning. Our sister NGO, boMake Rural Projects, provides funding for school bursaries for the artisans’ children, digging boreholes and building community halls for the groups that we work with. Working with Gone Rural means the women are able to be a part of developing their community as a whole. Can you share with us some examples of the multiple generations of women who have worked with Gone Rural? One of the most compelling stories of a multi-generational family of weavers is that which inspired the Song of the Weaver collection. Gogo Christina is the head of her family, and has been weaving since the inception of Gone Rural 27 years ago. Her daughter, Siphiwe, and granddaughter, Bonakele, are also weavers. She is proud of her children, and their family tree inspired the Framework basket showing how all the generations are woven together. Siphiwe is the backbone of her family. Leaving school after falling pregnant, she began weaving to support her family and had six more children with her husband. One day he sold all their cattle and left, not returning for four years. Siphiwe had to leave her husband’s family homestead, but with her income from Gone Rural she was able to start her life again – building a house and buying animals. The Arc series, incorporating cow bone pieces along a ribbed basket spine, is inspired by her strength. Bonakele is Siphiwe’s first daughter, who like Siphiwe left school at 16 after falling pregnant. She learnt to weave from her mother and joined Gone Rural to support her child. There are many ups and downs in her life but her daughter brings her great joy; this is represented in the Mother and Daughter basket pair and the Ups and Downs basket, showing how the lifeline of these women, with their various twists and turns, produces something beautiful and births a next generation of hope. How has your NGO made a tangible difference to the women’s lives? boMake Rural Project’s water project is one of the most impactful initiatives in the women’s communities. By drilling boreholes in drought-stricken areas of Swaziland and installing hand pumps to support this, the women have access to clean drinking water and do not have to travel long distances to collect water each morning. This not only improves the health of the overall community, but frees up time for children to attend a full day of school and more time for the women to do income-generating work. The difference that this makes is long-lasting, beyond the day-to-day. How do you keep your designs fresh and innovative? Our current focus for product design is on the artisans themselves. Through the Artisan-Led Design programme, initiated in 2017, we are training communities of weavers in design and product development skills, as well as drawing out their creativity and confidence to create contemporary, high-quality and beautifully designed products that tell their own stories and reflect their own inspiration. This has been carried out in three artisan groups and is being expanded to a fourth in 2019. This is the purest source of inspiration and results in products that are both innovative and grounded in the hearts of our weavers. What makes Swazi baskets distinctive from other African baskets? The quality of Gone Rural’s baskets is unmatched! We are also the only producer using Lutindzi grass to produce high-end basketry – this waxy, water-resistant grass is heat proof and hard-wearing, making it the best medium. Furthermore, our product designs are contemporary and chic, with constant injections of new design. Swaziland is a tiny country, but it’s positively exploding with creative energy and some of the most interesting craft coming out of Africa. Is there something in the water?! I think it really boils down to the generous nature of Swaziland’s people, especially her women. Because the women invest in teaching each other, creating together and sharing their work, the products of that work can only be beautiful. The world seems to have fallen in love with woven baskets. What do you think is behind this trend? I believe this is down to a desire to reconnect with nature and handmade – natural materials have a grounding power for our spirits, minds and homes while the knowledge that something has been painstakingly woven to perfection holds a value for the love that went into making it. Our baskets are beautiful, but in addition they hold an intangible beauty that I think we’re all craving in our increasingly hectic lives. What is the most unusual object Gone Rural has made from woven grass? Every day we’re making something new and exciting! The products that really allow the creativity of our talented artisans to shine are a series of functional sculptures designed by American artist Misha Khan for Friedman Benda gallery. 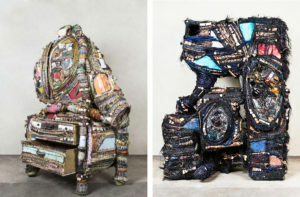 The women bring the artistic vision of Misha to life through an eclectic and unexpected mix of woven grasses and upcycled materials from local junk yards, and the results are breath-taking.